Depending on what legend you read, Hotei Buddha is either a Japanese God of Luck or a Zen Monk known for his cheerful and generous nature. 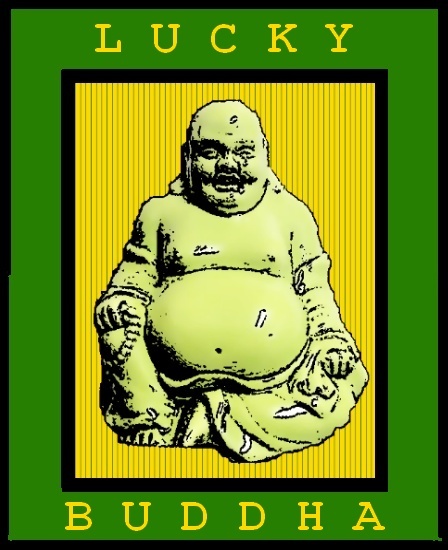 To further complicate matters, Hotei Buddha (also known as the Laughing Buddha) is often confused with Guatama Buddha the founder of Buddhism. Presently, through a process called conflation, he encompasses all three beings on some level. Hotei is traditionally depicted as a portly man dressed as a monk. His large stomach, which represents abundance and prosperity, often protrudes from his robes. The word Hotei means 'cloth-sack' and the Laughing Buddha is often seen carry such a sack from which he removes food, money, or candy. He is often seen surrounded by children. Overall he is seen as a generous spirit of luck, prosperity, and happiness. Images of the Laughing Buddha can be found at the entrances to Chinese Buddhist temples, as well as in many Chinese and Japanese restaurants. In addition many Root Doctors and Spiritual Workers will have images of him on their Wealth and Prosperity Altars. 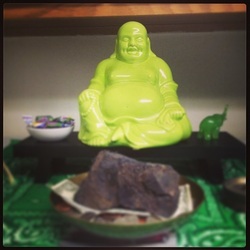 There is a widespread belief that rubbing Hotei's belly will bring good luck and prosperity. As part of my daily practices, I light a candle on this altar each morning and rub his belly. I often pray the 23rd Psalm followed by a more specific petition or prayer (if I have one.) Candles are often dressed with a Prosperity, Money-Drawing, or Money Stay With Me Oil and the equivalent incense is burned as well. If I have accepted petitions for others their needs will also be addressed. Hotei is surrounded by symbols of prosperity such as Maneki Neko, a piggy bank, and dried rice. In addition I have a large green bowl of trained hunting money on top of which is a large lodestone fed daily with magnetic sand. There are several smooth, flat stones around the altar on which you will find gems, coins, and other curios such as pyrite. These items are believed to draw in money and prosperity, and placing them on these stones represent building your fortune on a solid foundation. A Boss-Fix Honey Jar can also be found on the altar for continued employment and contentment on the job. Other items on the altar include a Wishbone, a Rabbit's Foot, a Gold-Plated Elephant with Trunk Raised (facing my front door), and images drawn from the Tarot. The box on which the Maneki Neko statue sits also contains a Money Drawing Mojo Bag when it is not being carried, or fed. Every other week I make offerings of apples to Hotei in thanksgiving for my blessings. A shot glass of fresh water is kept on the altar and is renewed every day. Finally, as a person who enjoys comedy and jokes I consider my own laughter an offering to this happy and generous figure.